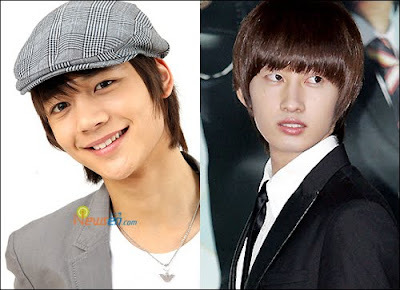 Home » eunhyuk » Minho » NEWS » [News]Suju Eunhyuk "Shinee Minho has changed after joining in entertainment (show)"
[News]Suju Eunhyuk "Shinee Minho has changed after joining in entertainment (show)"
Super Junior Eunhyuk said something about how Shinee Minho changed after he joining in variety shows. On the show KBS2TV "Let's go ! Dream team season 2" episode which will be aired on October 25th, Eunhyuk said "Minho has changed", "He had been very nervous as he is joining in variety show for the first time.He called me to asked me to teach him some secret methods but after attending 'Dream team 2", he no longer called me". Minho who was embarrassed after Eunhyuk said this about him and replied immediately "Leeteuk was the one I called! !Why are you like this ?" and expressed that Eunhyuk's words are unfair to him. haha,im not sure who is speaking the truth but, its ok whoever is speaking the truth. Actually if you notice, minho definitely is quiet during shows! Haha, whoever Minho has called, i hope Minho learned some methods and techniques from either of them! world k-pop news: [News]Suju Eunhyuk "Shinee Minho has changed after joining in entertainment (show)" "clickable"
0 Response to "[News]Suju Eunhyuk "Shinee Minho has changed after joining in entertainment (show)""